Buried alive. Butchered. Decapitated. Hacked. Mutilated. Killed. Archaeologist Samuel K. Lothrop did not obfuscate when describing what he thought had happened to the 220 bodies his expedition excavated from Panama’s Playa Venado site in 1951. The only problem is that Lothrop likely got it wrong. A new evaluation of the site’s remains by Smithsonian archaeologists revealed no signs of trauma at or near time of death. The burial site likely tells a more culturally nuanced story. The “long-overdue” reexamination of the Playa Venado site, which dates to 500-900 A.D. and is located near the Pacific entrance to the Panama Canal, revealed no evidence of ritual killing, said Nicole E. Smith-Guzmán, post-doctoral fellow at the Smithsonian Tropical Research Institute (STRI). Lothrop’s misinterpretations are likely due to the era of “Romantic archaeology,” underdeveloped methods for mortuary studies and literal readings of Spanish accounts of indigenous peoples after European contact. The article, co-authored by STRI staff archaeologist Richard Cooke, was published in Latin American Antiquity. But Lothrop’s 1954 paper, “Suicide, sacrifice and mutilations in burials at Venado Beach, Panama,” left its mark on the annals of Panamanian archaeology. It has been cited more than 35 times as evidence of violence, cannibalism or trophy decapitation. Some authors have used the paper to suggest Playa Venado is a mass burial site or a manifestation of conflict. In defense of Lothrop, who was an archaeologist with Harvard University’s Peabody Museum of Archaeology and Enthnology, bioarchaeology (the study of human remains from archaeological contexts) did not exist as a sub-discipline until two decades after his work concluded at Playa Venado. Today’s practitioners also benefit from methods developed in the 1980s and 1990s. Lothrop’s careful documentation and preservation of remains made reevaluation possible. Remains from more than 70 individuals from Playa Venado are at the Smithsonian’s National Museum of Natural History, sent there by Lothrop for osteological evaluation. Upon examination, Smith-Guzmán found only wounds that showed signs of healing well before the individuals died, including blows to the head and a dislocated thumb. Various broken bones and disarticulated remains discovered by Lothrop more likely explained by normal processes of decomposition and secondary burial of remains, which is believed to have a common ancestor-veneration practice in pre-Colombian Panama. Evidence suggests certain people’s remains were preserved for long periods of time before being buried in ritual contexts. “At Playa Venado, we see a lot of evidence of adults being buried next to urns containing children, multiple burials including one primary and one secondary burial, and disturbance of previously laid graves in order to inter another individual in association,” said Smith-Guzmán. Smith-Guzmán and Cooke’s reassessment of the Playa Venado burials suggests that ideas about widespread violence in pre-Columbian Panama need to be reconsidered. 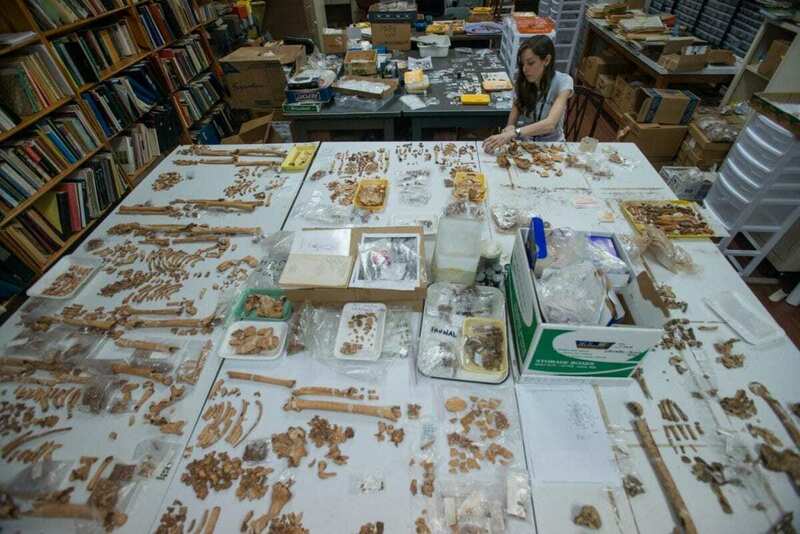 The research is part of a larger, interdisciplinary site reanalysis that will be published by the Dumbarton Oaks Museum in Washington, D.C..
Smith-Guzmán’s previous discovery of the first case of bone cancer in Latin America is featured on this month’s Smithsonian Sidedoor podcast.